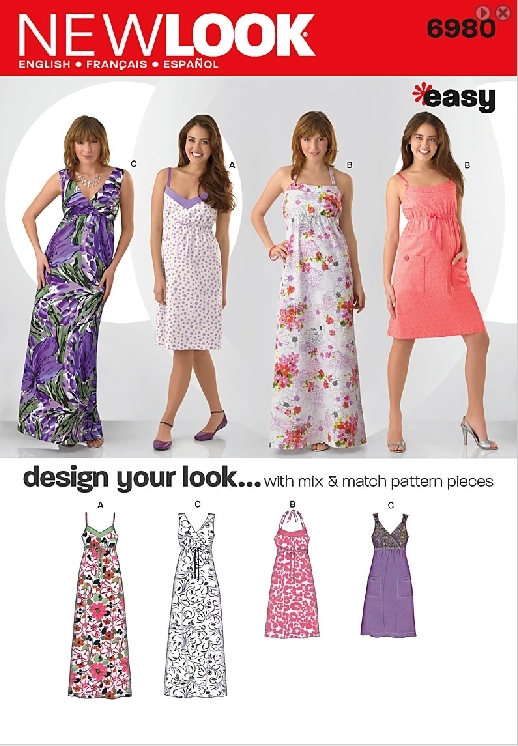 The Pattern: New Look #6980, Design-Your-Look Easy dress pattern. Made view C with the crossover bodice. The Fabric: A few years ago, I purchased yards and yards (well, probably only 4) of a beautiful tropical-print rayon in shades of vibrant turquoise and magenta pink that I planned to make a dress from—someday. About this Dress: I’ve always loved the boho maxi dresses that come around just about every summer, but have never found one that perfectly suited my taste, either in terms of design features or colors or patterns. But all of a sudden this past summer, I got the urge to make a maxi dress. This could have been because summer 2010 was blazingly hot in the DC area. 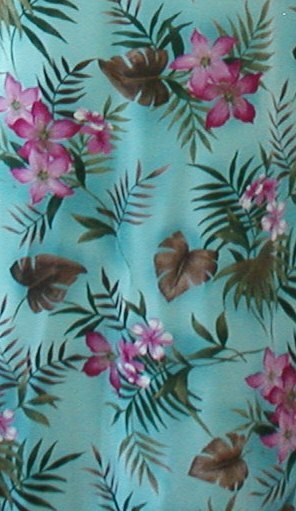 I remembered I had this rayon in my stash, pulled it out and looked it over, and was struck all over again by the saturated hues and how cheerful and simple and unusual the pattern was (compared to many tropical/Hawaiian prints I’ve seen, that is). Plus—the drape and flow of that wonderful rayon! But I didn’t have a maxi dress pattern that combined both the simplicity of design and construction I was interested in. So I searched online and turned up this New Look pattern and found it at my local Hancock’s. I had in mind to whip it up and wear it to a cook-out the next weekend. Unfortunately, I ended up not going to the cook-out, but I did manage to whip up this dress in less than a week—a record for me! It’s not by any means well-finished, but it’s sturdy. 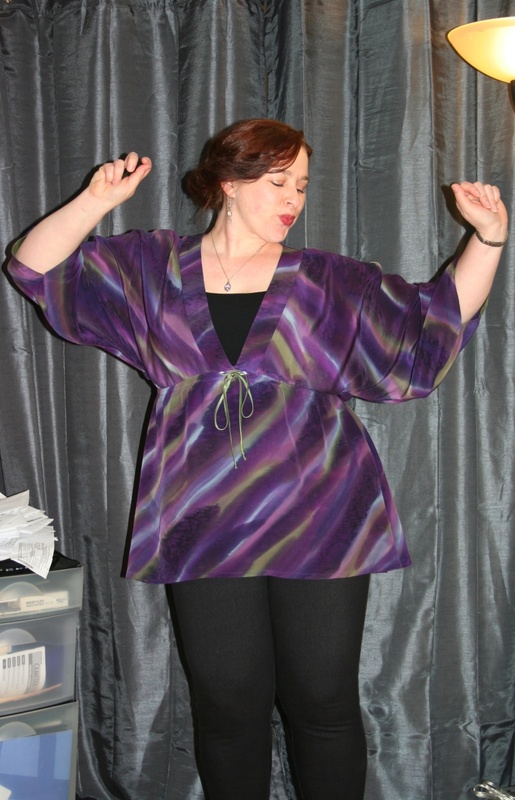 And boy does that rayon feel amazing draping itself around me as I walk! I didn’t make any real changes to the pattern, but I did add self-fabric ties to cinch the wide straps. One of the views shows fabric loops sewed down around the straps, in the same way required by the grey linen dress I made from New Look 6774, but I was looking for something a little quicker. I may replace the simple self-fabric tubes that I just tied around the straps with the pattern’s fabric loops. Or I may not! 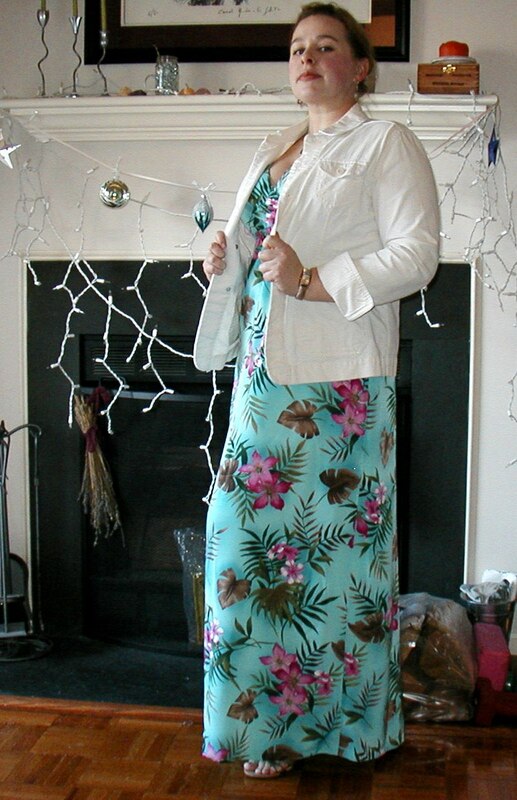 The dress looks killer with my wedge-heel gladiator sandals and a white twill jacket.